After stealing the hearts and sucking the bloods of theatergoers in 1958 in The Horror of Dracula, Christopher Lee spit out his fangs. Peter Cushing would go it alone with The Brides of Dracula. In 1963 Hammer would give us an all new bloodsucking cast with The Kiss of the Vampire. Lee would still star in Hammer films, but wouldn’t rise from the gave as Dracula until 1966’s Dracula: Prince of Darkness. Why the change of heart? According to legend, Hammer had just struck a new distribution deal with 20th Century Fox and they needs Lee as Dracula to seal the deal. Dracula: Prince of Darkness allowed Lee to rise from the ashes and not have to do too much heavy lifting. The movie reminds us how how Van Helsing (Star Wars‘ Peter Cushing) defeated Dracula, but that doesn’t mean the undead stay dead when killed. A local priest believes the vampires are coming back since their community is in the shadow of Dracula’s castle. The locals think he’s nuts. A group of tourists from England aren’t sure what to think, they just want to sightsee. The castle becomes part of their journey when they get dumped off in its shadow by a frightened driver. Luckily a driver-less carriage is ready to take them up to the castle where their luggage has mysterious appeared in their room. The guests want to be thankful to their host, but the servant who runs the place informs them his master’s been dead for quite some time. This is is legacy of hospitality. They have dinner and retreat to their rooms for the long night. Turns out the host isn’t completely gone. Dracula doesn’t show up until the halfway point in the film when one of the the houseguests gets curious and pokes around in a room that holds dark secrets. The servant performs a ritual to bring back the Prince of Darkness. Dracula can’t get enough of his new guests. Their only hope of using their round trip tickets is to find the priest. Dracula: Prince of Darkness is a welcomed return to the role for Lee. He doesn’t make you regret he returned from the dead since his time on screen is kept to a minimum. Dracula also doesn’t say anything on screen. He’s a man of action and blood sucking. This is great since you don’t have to dread any foolish lines coming from his fang filled mouth. Christopher Lee claimed he threw away his lines. Screenwriter Jimmy Sangster swears there were no lines. Either way, it works. What’s more horrifying than a monster who isn’t trying to sweet talk his victims or come up with witty dialogue? Scream Factory provides both the US and UK cuts of the film. What’s the difference? Oddly enough it is the US version that is complete. The UK censors got squeamish about the blood scenes. They snipped them short along with Dracula’s seduction of a female house guest. Although for a while only the UK version was available in the USA. 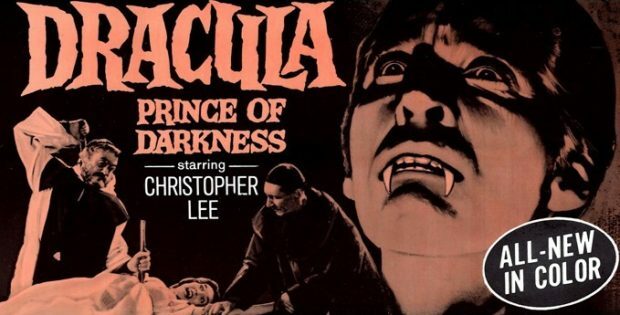 Dracula: Prince of Darkness proved to be the perfect return for Christopher Lee to the role. He’d return to the cape five more times for Hammer until 1973 although he’d say a few things on screen for the other installments. The video is 2.35:1 anamorphic. The film was shot using Techniscope. This was a cheap way to get the Cinemascope effect. Instead of compressing the image on the film, the camera uses half the image space. Two frames of space instead of 4 frames. This means that while Dracula: Prince of Darkness looks nice in the new transfer, it has a grainier image compared to other Hammer films. The audio is DTS-MA HD Mono. You will hear Lee hiss clearly as Dracula. The movie is subtitled. Audio Commentaries include author Troy Howarth that focuses on the film and it’s role in Hammer’s development as a studio in the late ’60s. A second commentary with Filmmaker Constantine Nasr And Writer/Producer Steve Haberman gets into the influences of the movie and the plot construction. Finally there’s a vintage commentary with cast members Christopher Lee, Suzan Farmer, Francis Matthews, and Barbara Shelley. This the prime listening joy. Lee has numerous tales from the set. He swears the Dracula with no lines was his invention. World Of Hammer Episode “Dracula And The Undead” (24:53) is from the TV series that celebrated the history of the studio. Oliver Reed narrates this episode about all the things that rose from the grave. They made 13 episodes back in 1990. Do hope that as Scream Factory releases more Hammer titles, we’ll get the complete show as bonus features. Back To Black – The Making Of Dracula: Prince Of Darkness (30:34) gives the background of the film. They talk about how Hammer made 4 films back to back in order to save on the budget. There’s praise for Terrance Fisher as a director. Super 8mm Behind-The-Scenes Footage (4:38) is silent, but has Christopher Lee and company talk about the footage. They do a great job identifying the people hanging around outside Dracula’s castle for the big finale fight. Theatrical Trailers (6:10) sets up the travelers being abandoned on the road outside Dracula’s castle. There’s also teasers for a double feature with The Plague of Zombies. Scream Factory is releasing a Blu-ray of Plague in January so you can recreate the double feature at home. The theaters gave out Dracula fangs and Zombie eyeglasses back then. Still Gallery (7:05) includes still from the original press kit and behind the scenes shots. Poster Gallery (4:50) shows that they did a lot to promote just the film and the double feature with Plague. Scream Factory presents Dracula Prince of Darkness: Collector’s Edition. Directed by Terence Fisher. Screenplay by: Jimmy Sangster. Starring: Christopher Lee, Barbara Shelley, Andrew Keir, Francis Matthews, Suzan Farmer and Charles Tingwell. Rated: Unrated. Running Time: 90 minutes. Released: December 18, 2018.